I am about to tell you everything you need to know about the Fenty Beauty products. 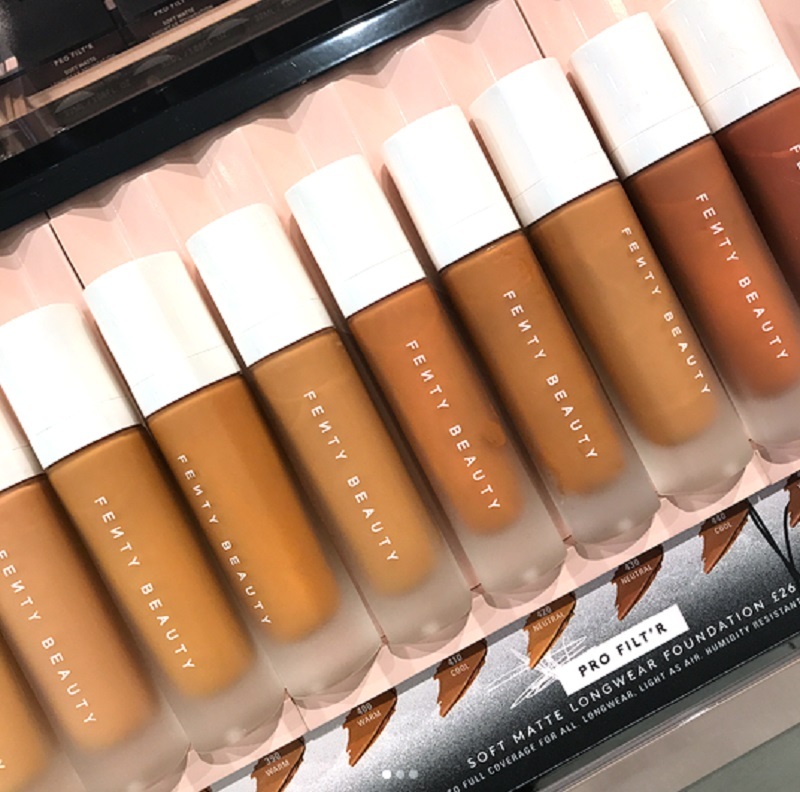 Though they were released only several weeks ago, they are still remarkably sold-out in most Sephora locations and this is why: Rihanna created a brand that holds true to its promise. Simple as that. Below I’ve reviewed three of the top products from the collection. At $32, this primer is averagely priced compared to the majority of other brands Sephora carries. While Rihanna did create an overall less expensive brand compared to other makeup lines (i.e. TooFaced, Urban Decay, Smashbox, MakeupForever, Nars) the price points are still higher than drugstore products. Is this righteously so? Yes. After receiving thousands of reviews, this primer is ranked five full stars on a majority of the websites it was featured on including FentyBeauty.com. The primer was described as having a soft, lavish scent and truly having a blurring effect on the skin. Individuals who applied this primer said it didn’t feel like they were wearing anything on their skin and yet their skin had a photoshopped-like appearance. Another reviewer emphasized how this primer does not have a dewy or matte-like finish. Instead, it’s versatile enough to be used by every skin type and has properties that both hydrate the skin while also preventing it from becoming too oily. Most importantly, the primer does maintain the look of the foundation throughout the day. Bottom line? Recommend. I tried this foundation myself, so this is going to be an honest review based on my personal experience. First, it should be known that I have extremely dry skin. I live in New York City so the dry, fall air and air pollution doesn’t help. I drench my skin in multiple moisturizers and jelly-based creams in a desperate attempt to quench my skin’s thirst. Therefore, instead of using the primer within this collection, I applied my unique combination of face creams to properly prepare my skin before applying the foundation. I tried the shade 290 (Neutral Olive) and a little bit of this foundation goes a long way. The foundation is significantly cheaper than most high-end brands that Rihanna has competed with. At $34, the amount of quality product you’re getting for the price is incredibly hard to beat. The foundation did immediately make a noticeable difference in the appearance of my skin but it did not do anything to maintain the hydration of my skin. I would describe the coverage as light-heavy depending on how much foundation you apply and if you build upon the layers applied. If you’re someone with extremely dry skin, I wouldn’t recommend this foundation for you. If you have normal-combination skin, this foundation can definitely work for you. Note that the foundation does have a matte-finish, so if you’re looking for more of a dewy-and sheer-like glow, this foundation wouldn’t be the best fit for you. Bottom line? Depends. I have tan skin with olive undertones and it requires me to use cool-toned browns if I don’t want to look like a burned carrot. I’m entirely serious. The Match Stix come in three ranges: lighter matte shades to conceal with, darker matte shades to contour with and shimmer shades to highlight with. The Highlighter Stix are wonderful for a subtle yet noticeable glow and apply in a creamy fashion. For a more significant highlight, you can use the Stix to build a base and top them off with a powder. The range of colors being offered is incredible for the highlighters. Not to mention, the powder highlighters released also coordinate with the Match Stix, allowing you to get both- a powder and cream formula that are already matched for you. The matte shades that can be used as concealers or contour sticks share the creamy formula as the highlighters. However, finding your exact shade can be a bit more difficult. I wasn’t able to find a shade in the contour sticks that satisfied my skin tone. Some of the browns that did have a cooler-tone were too dark for me to use and the lighter ones were too warm. I did apply the formula onto the back of my hand just to feel how light-weight and creamy the texture really was. While researching other reviews on these Stix, it came to my attention that several beauty bloggers had complained that the formula of the Match Stix seemed dry and caused the foundation to lift wherever they were applied. However, setting spray applied on the Stix before using it seemed to fix this problem for most. A strong selling point for the Match Stix is that they come with a lot of product for their price. Bottom line? Depends. The collection has been a success not just for Rihanna, but the individuals who felt like this line catered to their specific needs. Women of color have consistently been neglected when it comes to finding foundation or skincare products focusing on their spectrum. While other makeup brands have released a large variety of products that range in color, Rihanna’s is of the first that was primarily made for individuals of every skin tone and by a woman of color herself. She has firsthand experience to what it means to be a woman of color. Just as a lack of representation in cosmetics affected her, it affected many others. Until now. What really intrigues me about Fenty is that most of their stuff is vegan. I’d love to try it out at some point. I think it’s solely being sold through Harvey Nichols in the UK.